Mark Jones (centre, red) of Peterborough Sports failed to convert this early chance at Spalding. Photo: James Richardson. It’s been a bleak midwinter for Peterborough Sports who are now only off the bottom of the Evo Stik Division One South table on goal difference. Sports went down 2-0 at Spalding today (December 26) after conceding two first-half goals, one to a Lee Beeson penalty and one an own goal by the city side’s goalkeeper Dan George. The Tulips were ending a run of eight successive defeats to halt their own slide down the table. Lewis Webb (red) in action for Peterborough Sports at Spalding. Photo: James Richardson. Beeson struck from the penalty spot after just eight minutes following an ill-judged challenge by Richard Jones. Contact might have been outside the box, but there was no denying Spalding deserved their lead against sluggish opponents. The second goal was pure farce as Beeson’s corner was punched into his own net by George who was challenged only by team-mate Dan Lawlor. The city side improved after the break, but missed their only shot at a lifeline from the penalty spot seven minutes from time when Lewis Hilliard fired over the bar. Sports have conceded nine penalties this season and all have been scored, while they have converted only one of four penalties of their own. The good news for Sports was the return from injury of Richard Jones and Josh Moreman, but more bad news arrived on the final whistle as bottom club Romulus grabbed a last-gasp winner in their game against Chasetown to catch Sports on points. Lee Beeson scores from the penalty spot for Spalding against Peterborough Sports. Photo: James Richardson. Sports could well be rock bottom by the time they host Stamford AFC on New Year’s Day as they travel to sixth placed Bedworth on Saturday (December 30) when Romulus host lowly Carlton. And Stamford will be licking their lips at a trip to PSL. 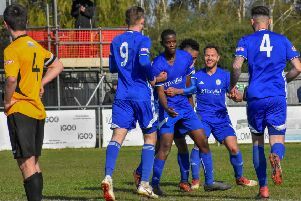 They are up to fourth after a superb 2-0 win over second-placed Corby Town at the Zeeco in front of a terrific crowd of 622, their highest of the season, and the best in the division today by almost 250. A great strike from Liam Adams fired the Daniels in front just before the break and a lovely Rob Morgan effort sealed another home win early in the second-half. Stamford are now just two points off the second promotion place after a run of four wins and a draw from their last five matches. They have the second best defensive record in the league after keeping clean sheets in four of their last five games. Division One South: Spalding Utd 2 (Beeson, George og), Peterborough Sports 0; Stamford 2 (Adams, Morgan) Corby Town.